The trailer would have you believe that 2 Guns is a buddy cop flick, and while it does have some buddy-cop-flick moments, that really isn't what this film is at its core. 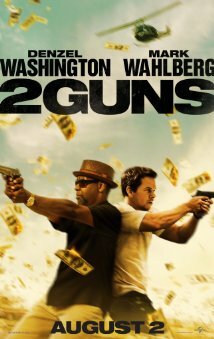 2 Guns is really a crime film revolving around a drug lord, corrupt high ranking government officials, and two government agents who have been assigned to the case, DEA agent Bobby Treanch (Denzel Washington), and naval intelligence officer Michael Stigman (Mark Wahlberg). Both are undercover, neither having any idea who the other actually is. As one might expect, neither is very happy when they have that epiphany. Eventually they realize that each is the other's best bet to get to the bottom of things. I wasn't really sure what to expect going into 2 Guns. I knew that it was based on the aforementioned comic, but I didn't know anything about the story. It had two of the more reliable leads around in Washington and Wahlberg, but the trailer made it look a bit cheesy. I was pleased to find that the overall tone of the film was a bit more serious than the trailer made it appear. I was also amused to see the inclusion of Bill Paxton, Paula Patton, Fred Ward, James Marsden, and especially Edward James Olmos in the supporting cast. 2 Guns marks the second film in a row that I was pleasantly surprised by (after The Wolverine the week before). I hadn't originally planned to see this in theaters, but I'm glad that I did. 2 Guns provides a nice balance of crime, mystery, and comedy and comes in at just under two hours. It takes itself seriously enough to be interesting, but has enough fun to keep things from getting too bogged down. If you have time in between your summer activities and the slew of other films, 2 Guns is worth giving a look. - There is a scene towards the beginning of the film that won't play well to animal lovers. After that, it's just your standard-fare sort of violence. - Not so much a spoiler as a general FYI: the first issue of the sequel to the original comic book series was released last week as well. 3 Guns by Steven Grant and Emilio Laiso is out now. - I'm always amused by the types of crowds that a film draws. I was surprised that the majority of the crowd at the showing I saw was predominantly older. I don't know that if it was because of the time of day (early evening) or if stars like Washington and Wahlberg don't play as well to the younger crowd these days. I'm assuming it is a result more of the former than the later.